The University of the Philippines Manila (UPM) is a state-funded medical and research university located in Ermita, Manila, Philippines. It is known for being country's center of excellence in the health sciences, including health professional education, training, and research. It is the oldest of the seven constituent universities of the University of the Philippines System, even predating the founding of UP by three years. Originally established on December 1, 1905 as the Philippine Medical School and later called as the UP College of Medicine and Surgery on June 10, 1907. It was renamed as University of the Philippines Manila in 1983. UP Manila administers and operates the Philippine General Hospital, the largest medical center and the national referral center for health in the Philippines. The university is also the home of the National Institutes of Health. Its 14 hectare campus occupies two large city blocks and it contains pre-war heritage buildings and structures built during the American Period designed by American Architect William E. Parsons, which were declared by the National Historical Commission of the Philippines as historical landmarks. Since 2001, the College of Medicine and the College of Nursing has been recognized as Centers of Excellence by the Commission on Higher Education. The PGH Administration Building was declared by the National Historical Commission of the Philippines as a heritage building. It was built in the 1930s. On December 1, 1905, the Philippine Medical School was established under Commonwealth Act No. 1415. It opened on June 10, 1907, and was housed at the School for the Deaf and Blind located on Malecon Drive (now Bonifacio Drive). On June 18, 1908, the Philippine Assembly passed the Act No. 1870, also known as the University Charter, marking the birth of the University of the Philippines. The Act renamed the Philippine Medical School as the University of the Philippines College of Medicine and Surgery. The control and management of the medical school was entrusted to the University of the Philippines Board of Regents on December 8, 1910. Its name was shortened to the University of the Philippines College of Medicine on March 1, 1923. UP opened its doors in 1909 with the School of Fine Arts, the College of Liberal Arts, College of Medicine, College of Veterinary Medicine, College of Engineering and the College of Law. It also operates the UP College of Agriculture in Los Baños, Laguna. These schools and colleges, established on different locations, were transferred to the UP Campus along Pedro Gil Street, Ermita, Manila on July 1, 1910 except for the College of Agriculture. In 1907, the US government passed a law establishing the Philippine General Hospital (PGH). It was founded by Dean C. Worcester, an American who was a member of the United States Philippine Commission. On September 1, 1910, the 350-bed capacity hospital was opened to the public for health care delivery and clinical instruction and training of medical students. Dr. Paul Freer served as its first Medical School Dean until 1912. On February 5, 1915, the Philippine Legislative Act No. 2467 reorganized the Training School for Nurses into the PGH School of Nursing and established it as a department of PGH. A few years later, in 1914, 1915 and 1927, the School of Pharmacy, Department of Dentistry and the School of Public Health were created, respectively, under the UP College of Medicine. These units eventually became full-fledged degree-granting units in 1935, 1948, and 1932, respectively. The Old Supreme Court Building was known as the UP Villamor Hall during the American Colonial Period. It formerly housed the Conservatory of Music and School of Fine Arts. The university was destroyed during the Battle of Manila in 1945. However, the College of Medicine under then Dean, Dr. Antonio G. Sison, and PGH were still able to fulfill their mandate of attending to the injured and the sick. On December 15, 1948, much the university transferred to its sprawling 493 hectare campus in Diliman, Quezon City. Three units, Medicine, Dentistry and Public Health, were left behind in the war-torn UP Campus in Manila. On the 40th anniversary of the University of the Philippines in 1949, the original Oblation was transferred to UP's Diliman Campus in Quezon City from its original site along Padre Faura Street in Manila as a symbol of transfer of administrative seat. In April 1948, the UP College of Nursing, which established in the Diliman Campus, instituted the first baccalaureate program in Nursing in the Philippines. More academic units were established in the 1960s. These included the School of Allied Medical Professions (1962), housed then at the National Orthopedic Hospital (now called the Philippine Orthopedic Center), and the Philippine Eye Research Institute in 1965. With the clamor to meet the health science education needs of the growing population, a Health Sciences Center within the University of the Philippines was created through the passage of RA 5163 on June 17, 1967. It was mandated to seek and emphasize the highest standards of training and research in the various health sciences. However, the Center at the Diliman Campus did not materialize due to fiscal constraints. In 1972, the UP College Manila was instituted as the first extension unit to offer liberal arts courses. Thereafter, UP was reorganized into the University of the Philippines System to effect institutional unity, while allowing decentralization of authority and autonomy of the component units through Presidential Decree No. 58, promulgated on November 20, 1972, under the administration of President Ferdinand E. Marcos. It was approved by the Board of Regents at its 828th meeting on November 21, 1972, and was implemented on January 1, 1973. The UP Health Sciences Center became an autonomous component of the UP System through Executive Order No. 519 dated January 24, 1979. At that time, the Center was composed of the College of Medicine, College of Pharmacy, College of Dentistry, Institute of Public Health (now the College of Public Health), School of Allied Medical Professions (now the College of Allied Medical Professions), Philippine General Hospital, UP Health Service, Philippine Eye Referral Institute (renamed as the Institute of Ophthalmology), National Teacher Training Center for the Health Professions, Comprehensive Community Health Program, and the Anesthesiology Center Western Pacific. The last two units have since been abolished. UP-PGH Nurses Home as seen from the intersection of Taft Avenue and Padre Faura Street. It was designed in Neoclassical Style by Filipino Architect Tomás Mapúa. Through Executive Order No. 4, issued by then UP President Edgardo Angara on October 22, 1982, the UP Health Sciences Center was renamed as the University of the Philippines Manila and it became the second autonomous unit of the UP System. The College of Nursing and the College of Pharmacy located in UP Diliman were transferred to the UP Manila, where they joined the rest of the health science units. On December 21, 1983, UPM underwent its first reorganization through Executive Order No. 11 integrating the UP Health Sciences Center and the College of Arts and Sciences (formerly called UP College Manila). The Board of Regents approved the second reorganization of the UP Manila at its 1007th and 1008th meetings on December 21, 1987 and February 11, 1988, respectively. This reorganization transformed and crystallized UP Manila’s philosophy, mission, organizational structure, governance and academic programs to what they are today. In 1989, the Institute of Health Sciences which used to be an extension unit of the College of Medicine, was transformed into the School of Health Sciences and became an independent unit. Since 2001, the College of Medicine and the College of Nursing are recognized as Centers of Excellence by the Commission on Higher Education. In addition, the College of Nursing is a WHO Collaborating Center for Leadership in Nursing Development in the Asia-Pacific region. The Southeast Asian Ministers of Education Organization named the College of Public Health as the SEAMEO-TROPMED Regional Center for Public Health, Hospital Administration, and Environmental and Occupational Health. The National Teacher Training Center for the Health Professions is a WHO Regional Education Development Center for Health Professions Education. The centennial celebration of the University of the Philippines began on January 8, 2008. As part of UP's centenary, an Oblation statue in front of the Philippine General Hospital was unveiled in December 2008. In 2013, UP Manila was badly criticized when Kristel Tejada, a 16-year-old behavioral sciences student, committed suicide because she couldn't pay for her tuition fee for the second semester and was left with no choice but to drop out of school. The Tejada family also has to pay the loan Kristel had taken for her first semester tuition. This event led to numerous student protests nationwide, mostly coming from the state universities and colleges, and the students from the UP System. The university was later pressured to lift its "no-late-payment" policy on tuition. The Supreme Court Main Building, formerly the Main Library of UP. Oblation Plaza as seen from the main entrance of Philippine General Hospital. 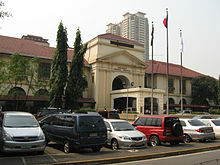 The University of the Philippines Manila is situated in the bustling area of Ermita, Manila. Its 14 ha (35 acres) campus is the home to the Philippine General Hospital and the National Institutes of Health. It is the second largest university campus in the City of Manila after the 22 ha (54 acres) University of Santo Tomas. 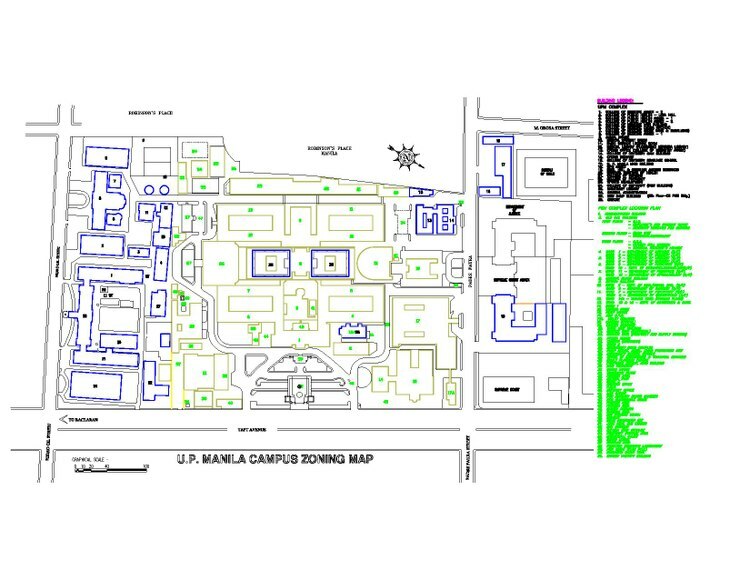 The campus is bounded by United Nations Avenue to the north, Taft Avenue to the east, María Orosa Avenue and Robinsons Place Manila to the west and by Pedro Gil Street to the south. The university is served by the United Nations and Pedro Gil Station of the LRT Line 1. UPM's buildings vary in age from the PGH Administration Building of the 1930s to new dormitories and facilities constructed in 2017. Most of UP Manila's buildings are designed in Neoclassical style, a theme which has been preserved in recent architectural addition. Many buildings in the campus were designed by American Architect William E. Parsons, in accordance to the Burnham Plan of Manila. The design of the Philippine General Hospital became the template for many tropical hospitals in Asia and tropical America. The National Historical Commission of the Philippines declared several sites within the campus, specifically the Philippine General Hospital, as heritage zones and were listed in the National Registry of Historic Sites and Structures in the Philippines. The UP Manila Campus Planning, Development and Maintenance Office (CPDMO) offers planning and design services to all sectors of the university. It manages the creation of spaces that support and enhance teaching, research, and public service activities of UP Manila. It is also tasked to recover the lots and buildings that belongs to the university which are now occupied by the Court of Appeals, Department of Justice and the Supreme Court of the Philippines. The Supreme Court has announced its plans to vacate its UP Campus site in Manila and move to the Bonifacio Capital District in Taguig with the Court of Appeals upon the completion of their new state-of-the-art building. The Department of Justice is also slated to move to New Clark City. CPDMO is located on the former UP College of Dentistry Annex Building, which was constructed in the 1960s. The UP Manila Museum of a History of Ideas along Padre Faura Street. The UP Manila University Library and its nine college-based units compose the campus's library network, and as of October 2000 the library has a total collection of 189,874 volumes, including videos, sound recordings, and photographs. Since 1995, the University Library was a member of the Department of Science and Technology – Engineering, Science and Education Library Network Project. The UP College Medicine Library, officially as the Dr. Florentino B. Herrera, Jr. Medical Library, is a center for the study of medical and clinical sciences, and its collections are particularly strong in the subjects of basic and clinical biomedical subjects. It occupies the building adjacent to the University Library. Both library buildings were permanently closed in 2016, after they were endangered when the foundation of the nearby under-construction UP College of Medicine Academic Center sank. Both buildings are now slated for demolition and will be replaced with a new University Library Building. On October 22, 2014, the university inaugurated the UP Manila Museum of a History of Ideas. The museum showcases the contributions of the University of the Philippines to the critical imagination that shaped the Philippines as a nation in the early 20th century. It was opened to the public on December 2, 2014. The UP Manila School of Health Sciences operates on three campuses located throughout the Philippines. Its main campus was the UPM-SHS Palo Campus in Palo, Leyte. The other two campuses are the UPM-SHS Baler, Aurora Extension Campus in Luzon, and the UPM-SHS Koronadal City Campus in Mindanao. Calderon Hall, the home of the UP College of Medicine which was recognized as a Center of Excellence by the CHED. Main entrance to Rizal Hall, the home of the UP College of Arts and Sciences. As the leading institution for medical education and research, UP Manila is regarded as the Health Sciences Center of the Philippines. The university is one of the four pillars of the Metro Manila Health Research and Development Consortium. The UP College of Medicine and the UP College of Nursing has been recognized by the Commission on Higher Education as Centers of Excellence since 2001. Likewise, its biology, medicine, and nursing programs have been listed as National Centers of Development and Excellence as of February 2001. UP Manila develops programs that serve as models and benchmarks of health education and health care in the Philippines. Many of the pioneering curricular programs are offered only in the university even until now, such as the Integrated Arts and Medicine Program (seven-year medical program); Master of Rehabilitation Science; MS in Clinical Audiology; MA in Health Policy Studies; the step-ladder curriculum of the UP Manila School of Health Sciences, which was based in Leyte, that offers integrated courses on barangay health work, community health work, midwifery, nursing, and community medicine; and recent offerings that include the MS in Medical Informatics and the Diploma in Bioethics, a joint program with UP College of Social Science and Philosophy based in UP Diliman. The excellence of UP Manila's health courses is proven by the consistent 100% passing of its graduates in nearly all health licensure examinations every year, their placement in the top 10/20 posts of each exam, and consistently garnering the highest national passing rate among all health universities and colleges in the country, a feat which has been recognized many times by the Professional Regulation Commission. Its community-oriented programs has been lauded worldwide. UP Manila has nine degree-granting units, and it is a part of the University of the Philippines System. The university has a total personnel complement of 1,328, while the Philippine General Hospital has 3,844 employees as of December 2016. Admission to the university is very selective. Prospective students must pass the University of the Philippines College Admission Test, which is part of the admission requirements for all the component units the University of the Philippines System, including UP Manila. The university spends most of its budget to the students. For the school year of 2017 to 2018, UP Manila offers tuition-free education to its medical students through a cash grants program. It was funded through the ₱317.1 million allocation for eight selected state universities and colleges nationwide which offers medical programs, with each institution receiving an allotment of ₱39 million. Students who will benefit from this program are expected to render a one-year "return service" to the Philippines for every cash grants he or she receives. The program, although separate in nature, is still a part of the ₱8.3 billion free tuition program for undergraduate students in all state universities and colleges nationwide, or the Universal Access to Quality Tertiary Education Act, which prompted the university to stop collecting tuition fees to all undergraduate students indefinitely. In research, UP Manila has been pursuing its mandate by generating and disseminating knowledge and technologies that can effectively contribute to the improvement of the quality of life of Filipinos. Its research outputs have greatly influenced the thrusts and directions of national health care programs and have been used as basis for policy formulation and implementation. Researches which exerted the biggest national impact on Philippine health care include several research-based program recommendations generated through the national surveys on blindness and the studies on Hepatitis B, diarrhea, and common parasitic infections, which were adopted by the Department of Health; commercialization of five herbal medicinal formulations (lagundi, yerba buena, tsaang gubat, sambong and akapulko); textbooks and instructional manuals which are also used by other academic institutions; and recently, the evaluation by the UP National Institutes of Health of the performance of PhilHealth, the country's national health insurance program. UP Manila strongly opposes the conduction of local scientific studies and the legalization of medical marijuana. UP Manila is a part on the University Belt, a de facto sub-district of the City of Manila where there is a high concentration or a cluster of colleges and universities. 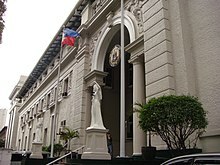 Students of UP Manila are known for their activism, since the Supreme Court of the Philippines, the Court of Appeals, and the Department of Justice are located within its grounds. The university has plenty of student groups focused on political change. It also has a variety of partisan groups ranging from liberal to conservative, and several third party organizations. The university has produced remarkable alumni in their respective fields. Dr. Carmencita M. David-Padilla is the 9th and current chancellor of the university, who is also an alumnus of UP Manila where she obtained her medicine degree in 1981. She has been recently reappointed will serve from November 1, 2017 to October 31, 2020.
Notable people from UP Manila include Elpidio Quirino, the sixth President of the Philippines, who graduated from the university with a law degree in 1915. Fe del Mundo, a pediatrician, was known as the first woman to be admitted as a student in Harvard Medical School, and was the founder of the first pediatric hospital in the Philippines. She graduated from the university in 1933 as valedictorian of her class. In 1924, Alejandro Melchor, who served as a Secretary of National Defense, obtained his civil engineering degree with the highest honors at that time when the UP College of Engineering was still based in Manila. Other notable UP Manila alumni includes Martino Abellana, a renowned Cebuano painter, and Trinidad Tarrosa-Subido, a linguist and poet. Political figures who were graduates of UP Manila include Jinggoy Estrada, a Philippine Senator, and Enrique Manalo, who served as the Undersecretary for Policy of the Department of Foreign Affairs. Revolutionary leader Nur Misuari was also a graduate of UP Manila, who obtained his political science degree in 1962. UP Manila alumni who served in the field of medical and health profession include three Secretaries of the Department of Health: Juan Flavier (1992-1995), who also served as a Senator from 1995-2007, Esperanza Cabral (2009-2010), and Enrique Ona (2010 to 2014). Dr. Louie Mar Gangcuangco was a graduate of the Intarmed program and is an international HIV researcher and best-selling novelist. Americans who graduated from UP Manila include two Brigadier General of the United States Air Force: Van N. Backman who obtained his bachelor of arts degree in 1955, and Patricia C. Lewis, who earned her masters degree from the university in 1977. Ernesto Domingo, a National Scientist of the Philippines, also graduated from the university. Alfredo Bengzon, the President and CEO of The Medical City obtained his doctor of medicine degree from the university. UPM alumni in academia include Paulo Campos, who was known for his work on nuclear medicine, Luciano P.R. Santiago, and Gregorio F. Zaide. The latter two are multi-awarded historians. In film, entertainment, and television, UPM is represented by comedian actress Maricel Laxa, and Vinci Montaner, a founding member of the band Parokya ni Edgar. Other prominent graduates include Victoria Tauli-Corpuz, an international activist for Igorot ethnicity. Some people, such as Diosdado Macapagal, the 9th Philippine President, Paz Latorena, a writer, and Grace Poe, a senator, attended UPM but did not graduate. ^ a b "Carmencita D. Padilla, MD, MAHPS". University of the Philippines Manila. Retrieved October 9, 2017. ^ a b c "visitor information". University of the Philippines Manila. Retrieved October 9, 2017. ^ "About Us". Philippine General Hospital. Retrieved October 25, 2017. ^ "The Oblation Unveiled in 1935". Bahay Nakpil-Bautista. Retrieved October 9, 2017. ^ "REPUBLIC ACT NO. 5163". Chan Robles Virtual Law Library. Retrieved October 10, 2017. ^ "Presidential Decree No. 58, s. 1972". Official Gazette of the Republic of the Philippines. Retrieved October 10, 2017. ^ Andrade, Jeannette I. (March 20, 2013). "Remains of Kristel Tejada to be taken to UP Manila". Philippine Daily Inquirer. Retrieved November 3, 2017. ^ "Students in provinces press for UP reforms". Philippine Daily Inquirer. March 21, 2013. Retrieved November 3, 2017. ^ Sauler, Erika (March 20, 2013). "Pressure on; UP Manila lifts tuition policy". Philippine Daily Inquirer. Retrieved November 3, 2017. ^ Alcazaren, Paulo (July 5, 2003). "Building a City Beautiful". The Philippine Star. Retrieved October 16, 2017. ^ "CPDMO". University of the Philippines Manila. Retrieved October 26, 2017. ^ Punay, Edu (August 18, 2014). "SC wants own building in Fort Bonifacio". The Philippine Star. Retrieved October 9, 2017. ^ Caruncho, Eric S. (June 2, 2017). "Mañosa firm wins design tilt for new Supreme Court complex in BGC". Philippine Daily Inquirer. Retrieved October 9, 2017. ^ Lopez, Virgil (April 25, 2017). "SC picks PHL flag-inspired design for new 'green' building in Taguig". GMA News Online. Retrieved October 9, 2017. ^ Mogato, Anna Gabriela. "Megaworld, BCDA team up to create new district in Fort Bonifacio". Rappler. Rappler. Retrieved March 15, 2019. ^ Lim, Janina (May 7, 2018). "Six gov't agencies set to move to New Clark City". BusinessWorld. Retrieved January 15, 2019. ^ "University Library". University of the Philippines Manila. Retrieved October 10, 2017. ^ "Foundation of new building at UP College of Medicine sinks: report". ABS-CBN News. December 17, 2016. Retrieved October 10, 2017. ^ "UP Manila Museum of a History of Ideas inaugurated". University of the Philippines Office of the Vice President for Academic Affairs. Retrieved November 14, 2017. ^ Yuson, Alfred A. (December 15, 2014). "Of museums, new & upcoming". PhilStar Global. Retrieved November 14, 2017. ^ "MMHRDC Members – Member Institutions". Metro Manila Health Research and Development Consortium. Retrieved October 17, 2017. ^ "Statistics : CHED's Centers of Excellence/Development (COEs/CODs)". Commission on Higher Education. Archived from the original on September 6, 2002. Retrieved October 25, 2017. ^ a b "About UP Manila". ICEDyn2017. Retrieved October 18, 2017. ^ "Annual Audit Reports - National Capital Region - University of the Philippines System Executive Summary 2016". Commission on Audit. Retrieved October 7, 2017. ^ a b Geronimo, Jee Y. (June 14, 2017). "Medical students to get free tuition in 8 SUCs". Rappler. Retrieved October 25, 2017. ^ Dioquino, Rose-An Jessica (June 15, 2017). "Palace bares SUCs with tuition-free med schools in 2017-2018". GMA News Online. Retrieved October 12, 2017. ^ Mateo, Janvic (June 15, 2017). "Medical students to get free tuition – CHED". The Philippine Star. Retrieved October 12, 2017. ^ Geronimo, Jee Y. (July 26, 2017). "No tuition for now for UP Manila, UPLB undergrads". Rappler. Retrieved October 12, 2017. ^ Cabico, Gaea Katreena (November 6, 2017). "UP Manila strongly opposes legalization of medical marijuana". PhilStar Global. Retrieved November 9, 2017. ^ "Organization Officers and Board of Trustees". Philippine Cancer Society. Retrieved November 23, 2017. ^ "Annual Report 2004" (PDF). Philippine Center for Population and Development. Retrieved November 23, 2017. ^ "Future Directions of Clinical Epidemiology in the Philippines". Acta Med Philippines. December 31, 2009. Retrieved November 23, 2017. ^ "Pediatrician and National Scientist Perla D. Santos Ocampo, 80". Official Gazette of the Republic of the Philippines. July 3, 2012. Retrieved November 23, 2017. ^ "National Scientist Perla Santos-Ocampo, 80". GMA News Online. July 3, 2012. Retrieved November 23, 2017. ^ "Annual Report 2002". Philippine Council for Health Research and Development. Retrieved November 23, 2017. ^ "MARITA V. T. REYES". University of the Philippines Manila College of Medicine Department of Biochemistry and Molecular Biology. Retrieved November 23, 2017. ^ "Teaching and Learning in the Health Sciences". Retrieved November 23, 2017. ^ "UP Manila has a New Chancellor". University of the Philippines Medical Alumni Society in America. October 9, 2011. Archived from the original on December 1, 2017. Retrieved November 23, 2017. ^ Laguyo, Dolores (October 6, 2008). "Chancellor Ramon Arcadio gets 2nd term". University of the Philippines Manila. Retrieved October 25, 2017. ^ "CURRICULUM VITAE" (PDF). University of the Philippines Manila. Retrieved October 25, 2017. ^ Jemena, Fedelynn M. (October 31, 2017). "Chancellor Padilla reappointed to a second term". University of the Philippines Manila. Retrieved October 25, 2017. ^ Chua, Philip S. (April 27, 2003). "Fe del Mundo, M.D. : At 94, still in the practice of Pediatrics". The Sunday Times Magazine. Retrieved December 26, 2007. ^ Engel, KeriLynn (August 9, 2013). "Fe del Mundo, first female student at Harvard Medical School". Amazing Women in History. Retrieved October 25, 2017. ^ "Duterte names DFA Usec Manalo to replace Yasay". ABS-CBN News. March 9, 2017. Retrieved October 25, 2017. ^ "Former senator Juan Flavier passes away". The Philippine Star. October 30, 2014. Retrieved October 25, 2017. ^ Search Results for author Gangcuangco LM on PubMed. ^ "Patricia C. Lewis". Hall of Valor. Retrieved November 3, 2017. History of UP Manila. University of the Philippines Manila. University History. University of the Philippines. PGH History. Philippine General Hospital.